Biopharmaceutical development and manufacturing demand scalable processes that can be quickly developed, easily implemented, and smoothly transferred to production. Disposable, ready-to-use technologies play a crucial role in providing flexibility to support agile biomanufacturing operations. Single-use systems provide process efficiencies by removing steps such as cleaning and cleaning validation, thus allowing for faster change-over between manufacturing runs. The biopharmaceutical industry is increasingly adopting single-use approaches, and the global market for such bioprocessing tools is expected to grow at a compound annual growth rate of 11.7% through 2019 (1). Meanwhile, the world continues to face mounting pressure related to a variety of environmental concerns: climate, water scarcity, and other resource availability issues. Rapid shifts in technology development or adoption present an opportunity — and an obligation — to evaluate sustainability implications. GE Healthcare performed the first detailed environmental life-cycle assessment (LCA) study comparing single-use technology and traditional fixed-in-place technology for monoclonal antibody (MAb) production (2–4). Summarized in detail at the end of this special pullout section, the results revealed that single-use technology exhibited less environmental impact throughout the product life cycle than did traditional process technology for the systems studied. That was primarily attributable to steam, energy, and water-forinjection reductions. The study also provided sustainability insights and recommendations that could help companies optimize existing production facilities or plan new biomanufacturing process lines, whether single-use or traditional (3). Here, the ACS Green Chemistry Institute’s Pharmaceutical Roundtable (GCIPR) presents a more recent report. It summarizes opportunities to improve the environmental sustainability of biomanufacturing. The GCIPR was formed in 2005 to encourage innovation while catalyzing integration of green chemistry and green engineering practices in the pharmaceutical industry, with a shared belief that such integration is an imperative for business and environmental sustainability (5). The institute’s vision for 2020 includes informing and influencing the research agenda (noting that life-cycle assessment is the proper way to evaluate environmental sustainability of products), creating tools for innovation, and educating future leaders (6). The GCIPR article highlighted in this special report is cowritten by experts and leaders from leading biopharmaceutical companies including Genentech, Pfizer, Amgen, Johnson & Johnson, and Merck Sharp & Dohme. The concepts and examples explored herein apply to multiple aspects of biomanufacturing using both traditional and single-use process technologies. 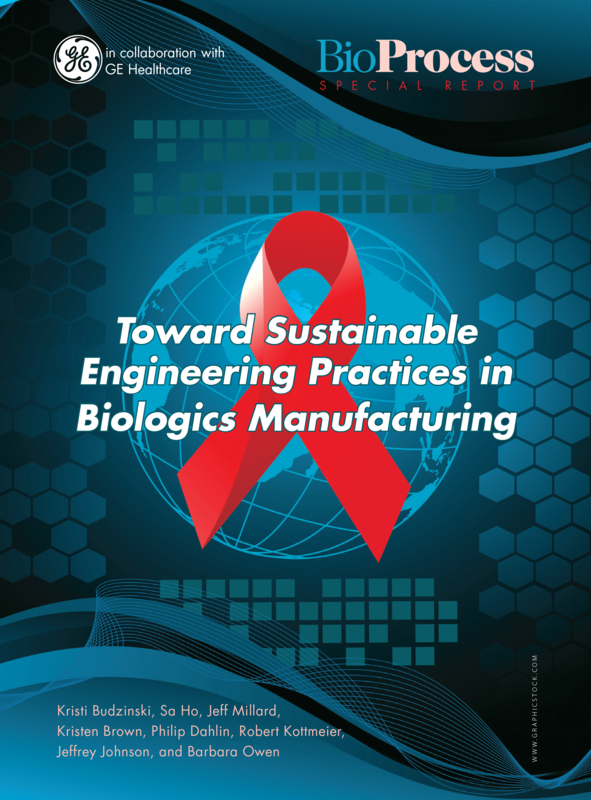 This publication should serve as a useful guide for readers seeking to improve the sustainability of their biomanufacturing operations. View the PDF for the entire special report. 1 Report BIO099B. Single-Use Technologies for Biopharmaceuticals: Global Markets. BCC Research: Wellesley, MA, 21 October 2015; www.bccresearch.com/market-research/biotechnology/single-use-technologiesbiopharmaceuticals-report-bio099b.html. 2 Pietrzykowski M, et al. An Environmental LifeCycle Assessment Comparing Single-Use and Conventional Process Technology. BioPharm Int. 24(11) 2011: 1–4. 3 Pietrzykowski M, et al. An Environmental Life Cycle Assessment Comparison of Single-Use and Conventional Process Technology for the Production of Monoclonal Antibodies. J. Cleaner Prod. 41, 2013: 150–162. 4 Flanagan WP, et al. An Environmental Life Cycle Assessment of Single-Use and Conventional Process Technology: Comprehensive Environmental Impacts. BioPharm Int. 27(3) 2014: 40–46. 5 ACS GCI Pharmaceutical Roundtable. American Chemical Society: Washington, DC, 21 October 2015; www.acs.org/content/acs/en/greenchemistry/industrybusiness/pharmaceutical.html. 6 ACS GCI Pharmaceutical Roundtable: Pharmaceutical Roundtable Fact Sheet. American Chemical Society: Washington, DC, 2014; www.acs.org/content/dam/acsorg/ greenchemistry/industriainnovation/roundtable/ACSGCIPharmaceutical-Roundtable-Factsheet-06-11-2014.pdf. William P. Flanagan, PhD, LCACP, is director of the Ecoassessment Center of Excellence for General Electric Company and chair of the board of directors for the American Center for Life Cycle Assessment; One Research Circle, K1-3D57, Niskayuna, NY 12309; 1-518387-5070; flanagan@ge.com.